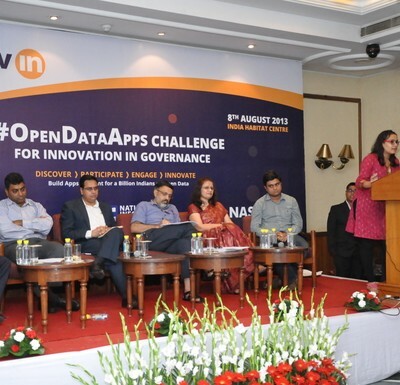 NIC in association with NASSCOM presents #OpenDataApps Challenge to encourage data-driven innovation. 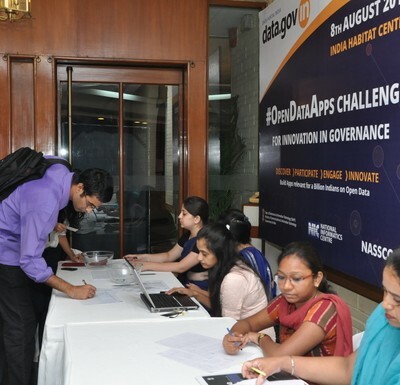 Here’s the chance to unleash your expertise in app development! 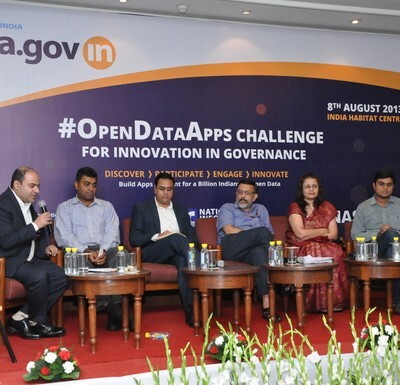 Create unique and useful Apps across platforms and devices ranging from Mobile/Tablet, SMS to Voice-based applications using Open Government Data. 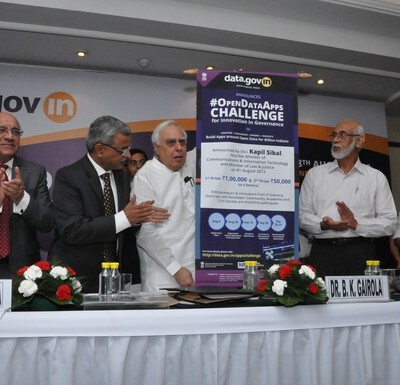 This Contest is open to individuals, teams of individuals and business entities inside the territory of India. Participant(s) must be aged 18-years or older, on the date of submitting the application. 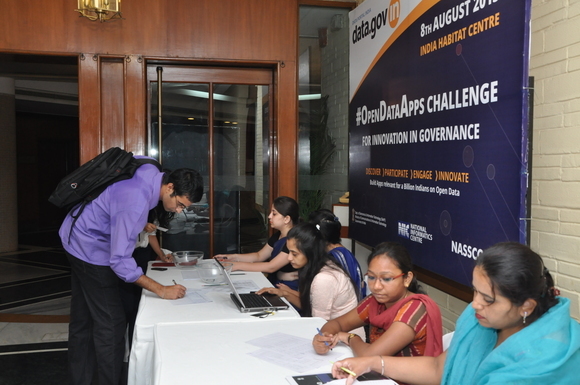 Employees and relatives of NIC and NASSCOM are not allowed to participate in this #OpenDataApps Challenge. In 3 Sectors to be decided by the Jury depending on the submissions. 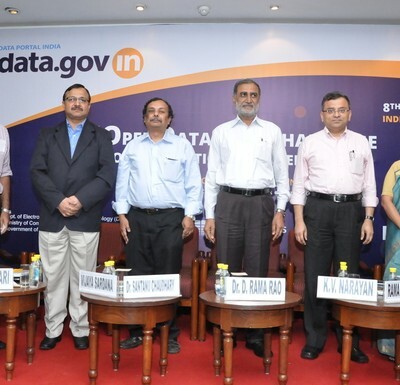 The Government of India, under the National Data Sharing and Accessibility Policy (NDSAP), is releasing a large number of government datasets from various departments to enhance delivery of government information, promote transparency, accountability and public participation in governance. 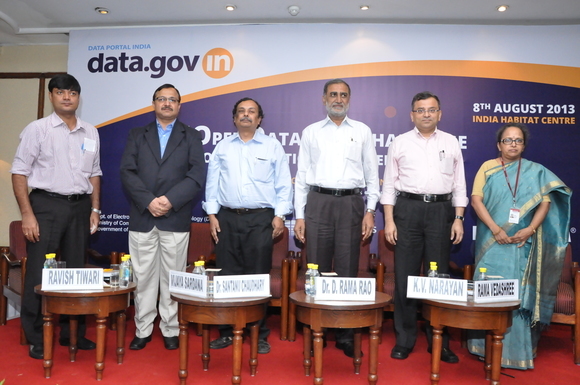 The NDSAP envisage proactive dissemination of Government Datasets through the Alpha release of Data Portal India (http://data.gov.in). 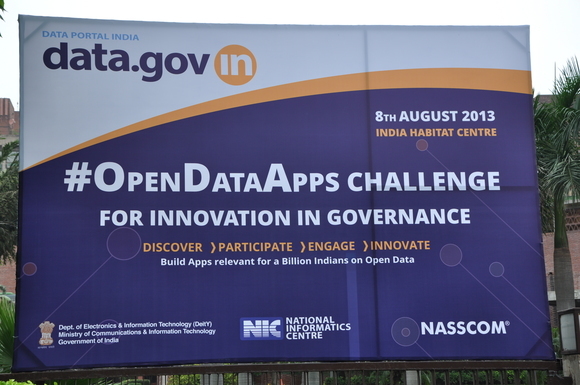 To encourage the use of these Open Government Data, NIC in association with NASSCOM started an initiative to create awareness among various stakeholders such as in senior leaders & data controllers from various ministries & departments, Entrepreneurs & Innovators from start-up and developers community, IT Industry & Private Sector, Academia and Civil Society together to DISCOVER > PARTICIPATE > ENGAGE > INNOVATE and build an ecosystem around Open Government Data. 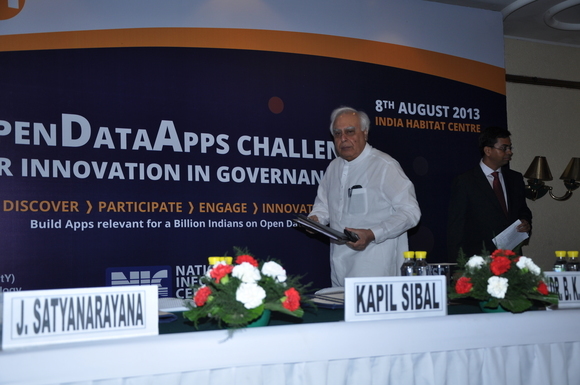 To boost innovation through Open Government Data and engage start-up & developer community to build an open data ecosystem, the National Informatics Centre (NIC) in association with NASSCOM organized a conference on “#OpenDataApps for Innovation in Governance ” at India Habitat Centre on August 8, 2013. 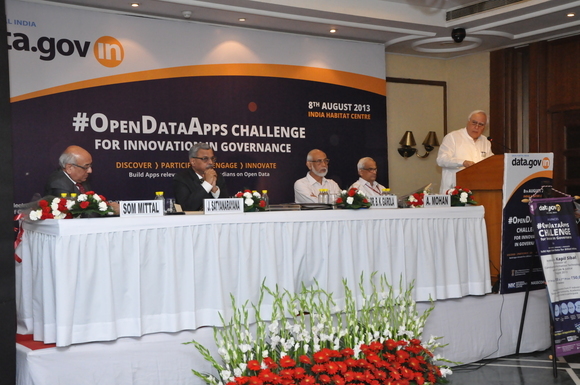 Hon’ble Minister of Communications & Information Technology and Minister of Law & Justice inaugurated the conference. 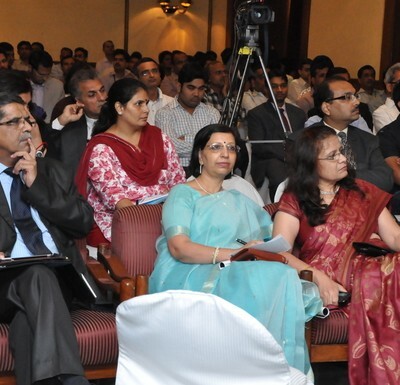 The conference began with a welcome address by Ms. Rama Vedashree, Vice-President, NASSCOM. 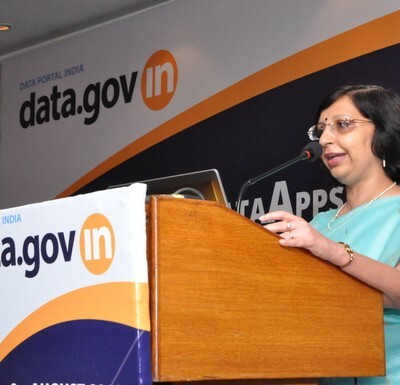 She emphasized to boost the Open Government Data Initiate of India. 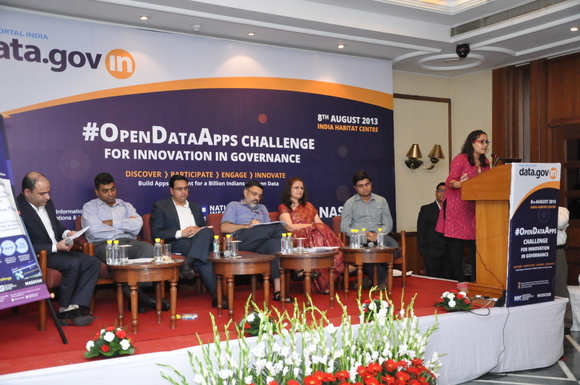 In this direction, she highlighted on the joint initiative of NIC and NASSCOM the #OpenDataApps Challenge. 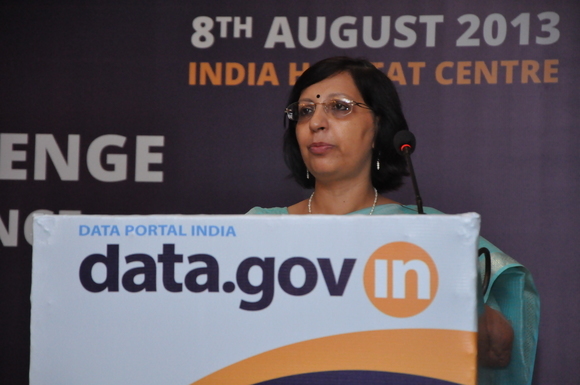 Ms. Neeta Verma, DDG, NIC, gave an overview of Open Data Initiative of India. 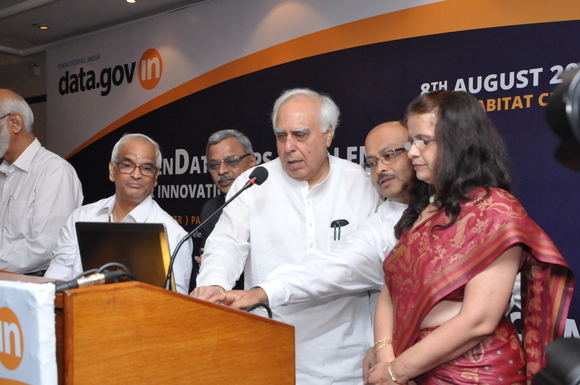 She talked about data-driven innovation for growth of the country. 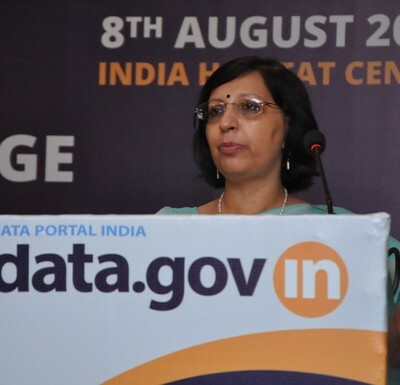 Talking about the 3500+ datasets contributed by 49 departments on Data Portal India, Ms. Verma highlighted the importance of engaging the stakeholders with Open Government Data. She stressed upon that Community Engagement will be one of the main focus for the Data Portal Team. 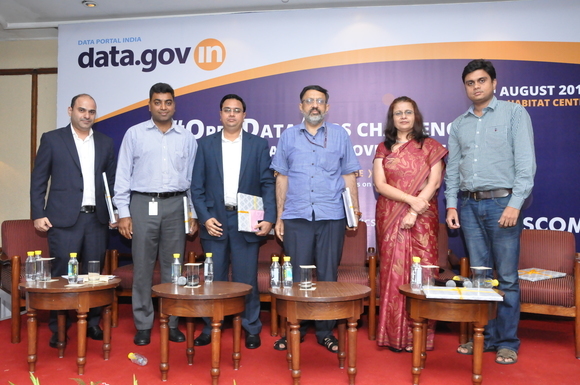 The conference proceeded with discussion on the Open Government Data and its potential impacts. Sh. 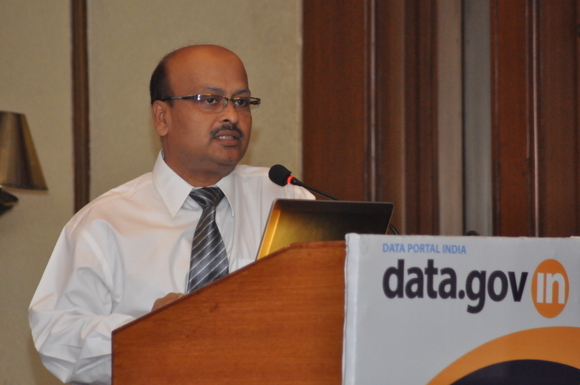 A Mohan, Director General, NIC, gave insights into the power of Open Data and current scenario of datasets on Data Portal India. 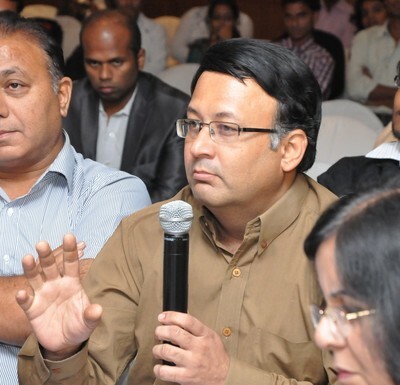 He said that in today’s internet era data is power of the society. 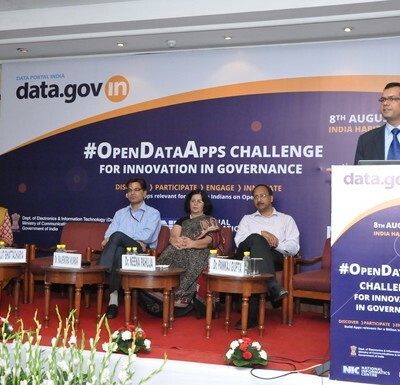 He informed that 80 Data Controllers have been nominated by Ministries and Departments to spearhead the Open Government Data initiative in their respective departments. 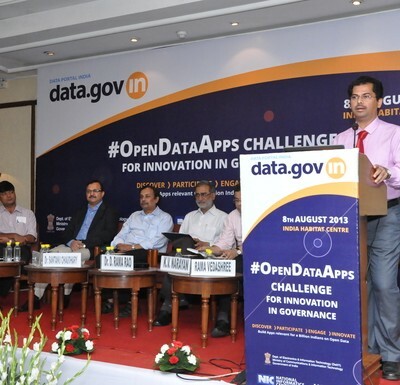 Dr. B. K. Gairola, Mission Director (e-Governance), DeitY, in his address highlighted that this initiative has provided a platform for using/reusing high quality reliable data and in near future live data feeds will be made available on the portal. 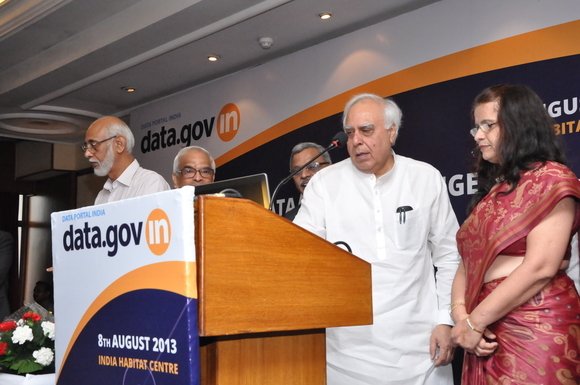 He also stressed upon the need of integrating various e-Governance initiatives. Delivering his address, Sh. 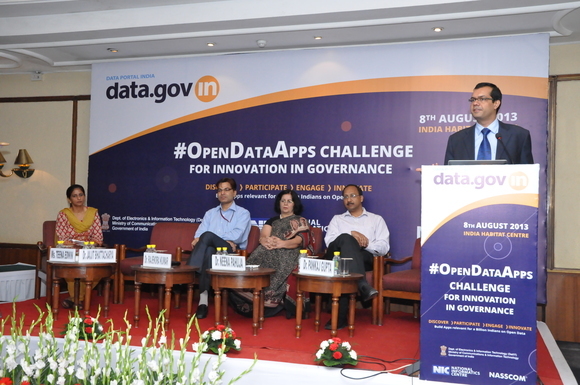 J. Satyanarayana , Secretary, DeitY, also highlighted how open data makes government more responsible and transparent. 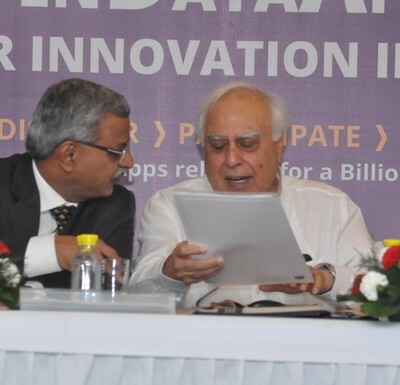 He said that Data Portal is multiplying the power of data and information by sharing and making it open to the citizens. 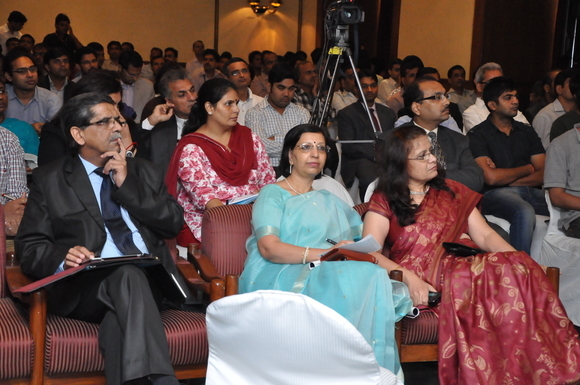 Dr. Sam Pitroda, Advisor to PM joined the Conference through the Video Conferencing facility of NIC. 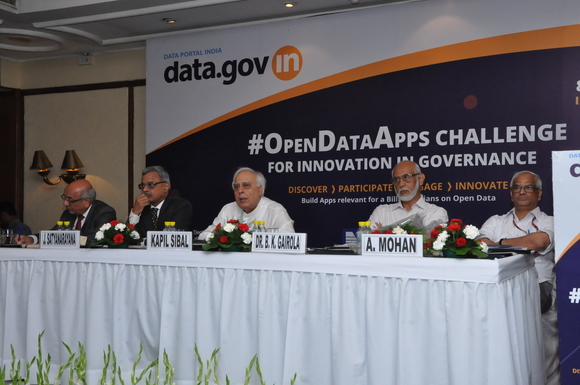 He addressed the gathering on the importance of Open Data and possible innovations around it for the benefit of citizens. 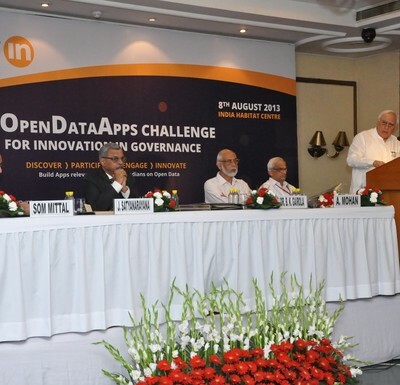 He urged the developer community to make at least 100 applications around the available datasets. 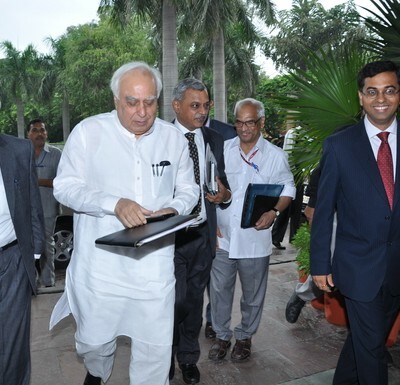 He said that this project is a great example of public-private partnership. 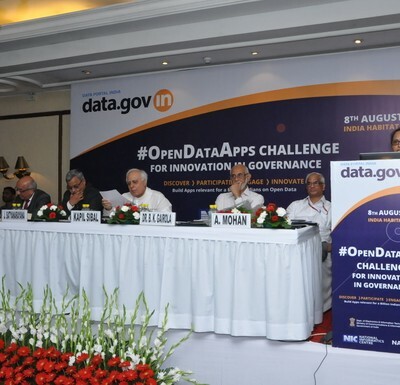 Union Minister of Communications & Information Technology and Minister of Law and Justice released Data Portal and announced the #OpenDataApps Challenge. Sh. 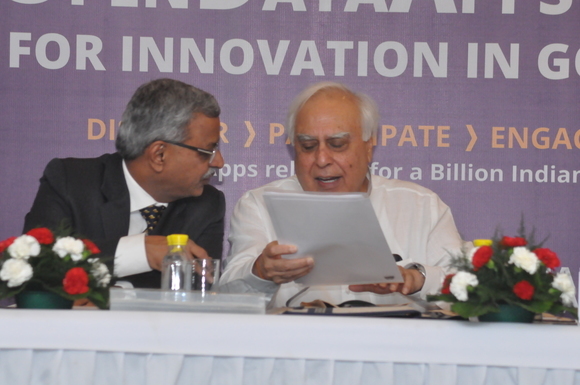 Sibal highlighted that Data is the foundation of policy making and in its absence appropriate decisions become difficult. He said focus should be on collating spatial data with non spatial data for planning activities. 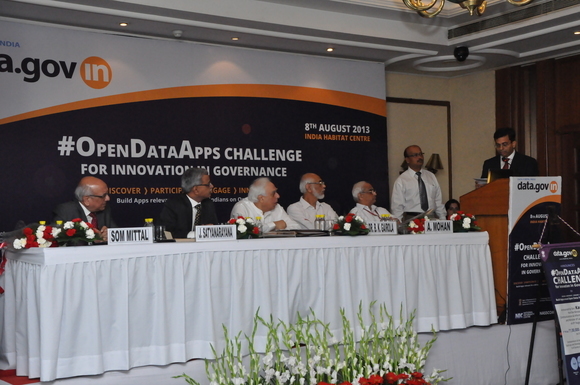 Applauding the #OpenDataApps Challenge, he expressed that the apps related to Agriculture sector i.e. 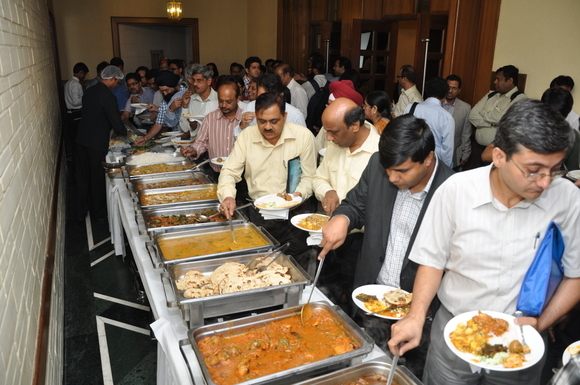 Crop information, Market price information and Educational sector would be useful for the growth of India. Sh. 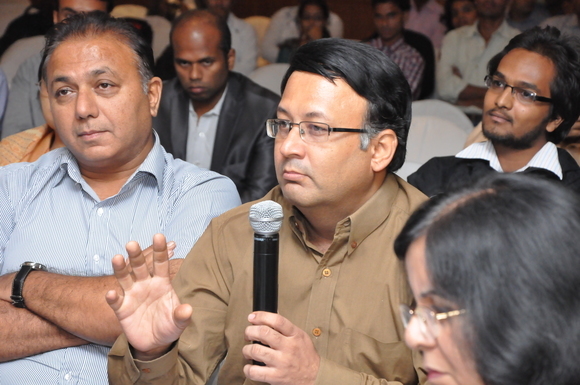 Abhishek Jee , Director (eGov), NASSCOM, thanked the guests for their esteemed presence & encouragement. 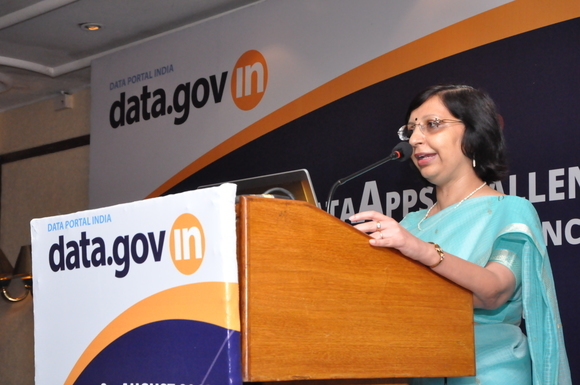 The conference proceeded with an overview of Open Data Platform by Ms. Alka Mishra, Sr. Technical Director, NIC, highlighting the main features and functionalities of the Data Portal. 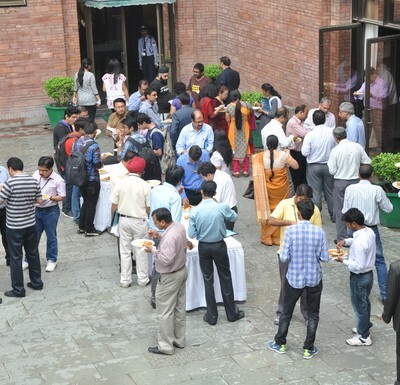 She demonstrated the citizen participation features which help in connecting them with the Government Ministries/Departments. Further, Sh. 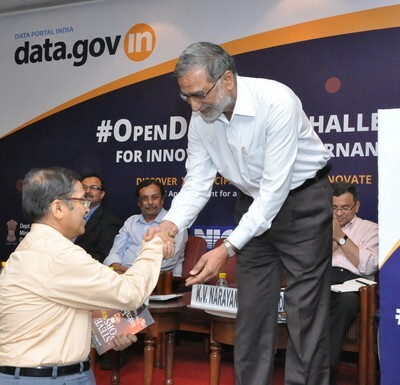 D. P. Misra, Principal Systems Analyst, NIC, gave glimpses of the community engagement initiatives taken up so far such as 12th Plan Hackathon, In Pursuit of an ‘Idea’, etc. 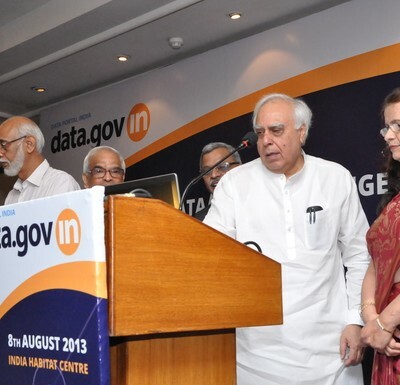 taken so far to strengthen the Open Government Data Initiative of India. 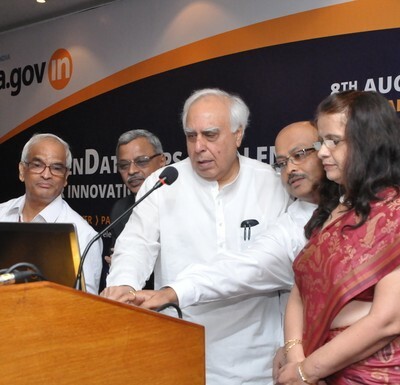 He also gave an overview of the Community section of the portal, which is the knowledge-sharing platform for citizens. 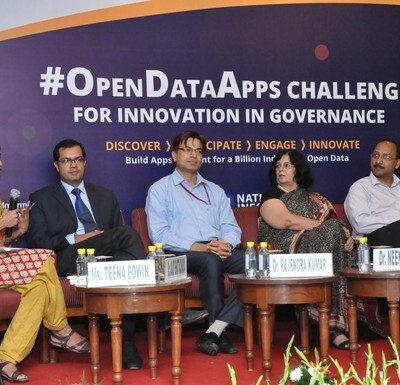 The panel discussion on “Open Data in Agriculture” was chaired by Dr. D. Rama Rao, National Director, National Agricultural Innovation Project, ICAR and co-chaired by Dr. Santanu Chaudhary, Professor, Indian Institute of Technology, Delhi. 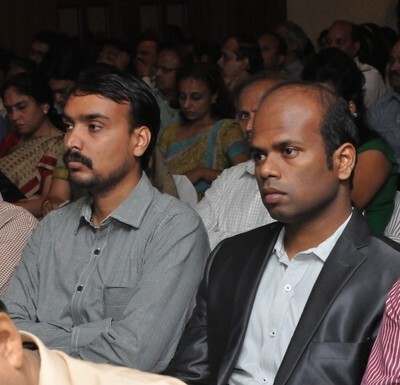 The panelists in this panel were Mr. Vijaya Sardana, Head – Food Security & Agribusiness (Policies & Program), UPL GROUP, Ms. Rama Vedashree, Vice-President, NASSCOM, Mr. K. V. Narayanan, Vice President, TCS and the panel was moderated by Mr. Ravish Tiwari, Senior Editor, Indian Express. 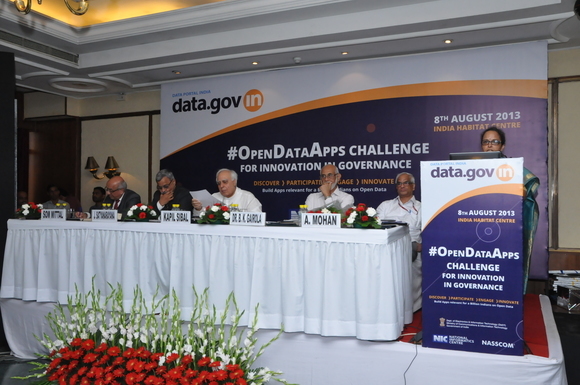 The panel discussion on “Open Data in Water, Sanitation, Health & Hygiene” was chaired by Dr. Rajendra Kumar, Joint Secretary (e-Gov), DeitY. 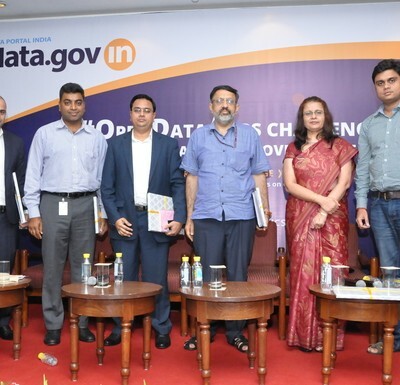 The panelists in this panel were Dr. Jaijit Bhattacharya, Corporate Director, HP India, Dr. Neena Pahuja, IT Strategy & Business Transformation Consultant, Dr. Pankaj Gupta, Partner, Taurus Glocal Consulting and the panel was moderated by Ms. Tina Edwin, Consulting Editor, India Today. 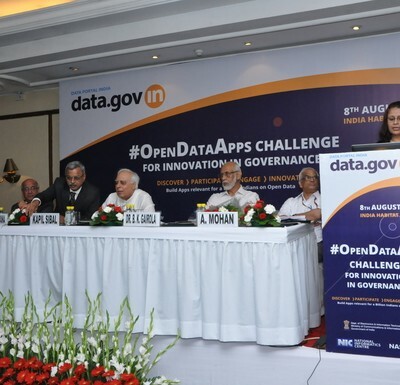 Dr. Pankaj Gupta presented on Open Data for innovation in governance and Dr. Neena Pahuja presented on Open Data in Healthcare Applications and Dr. Jaijit Bhattacharya presented on Open data for healthcare. 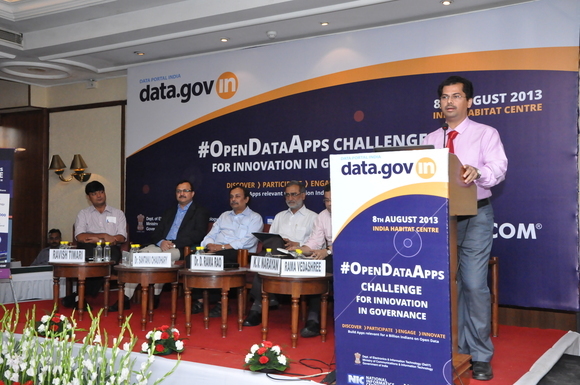 The panel discussion on “Innovation with Open Data” was chaired by Sh. 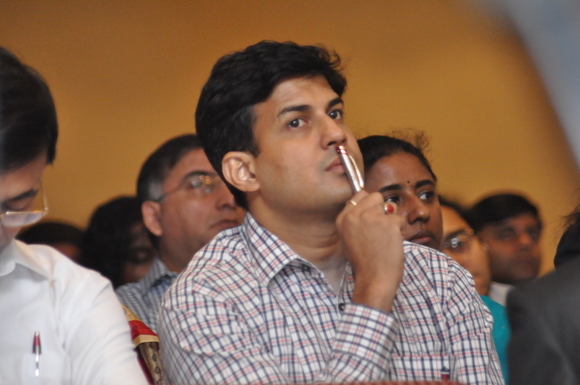 Rajiv Gauba, Additional Secretary, DeitY and co-chaired by Ms. Neeta Verma, Dy. 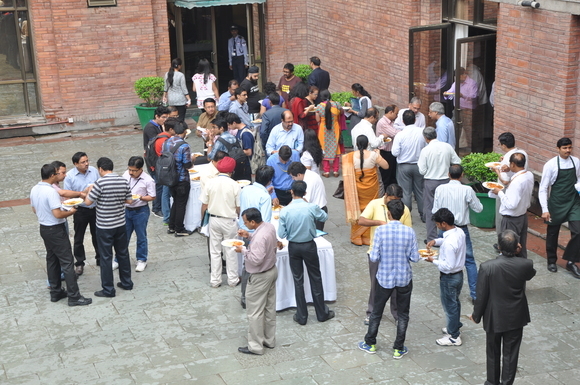 Director General, NIC. 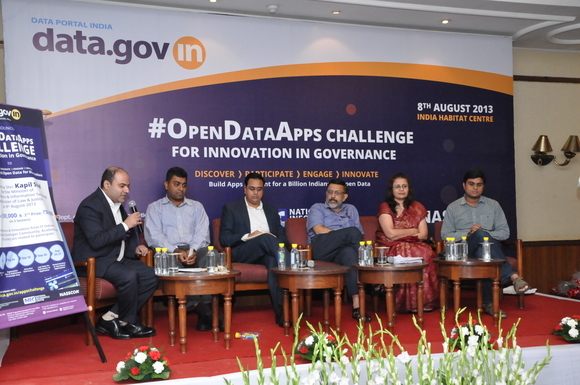 The panelists on this panel were Mr. Rajiv Mangla, Senior Director, Adobe Systems, Mr. Uttam Tripathi, Google and Mr. Vikas Aggarwal, Head – Industry Solutions, Microsoft and the panel was moderated by Sh. 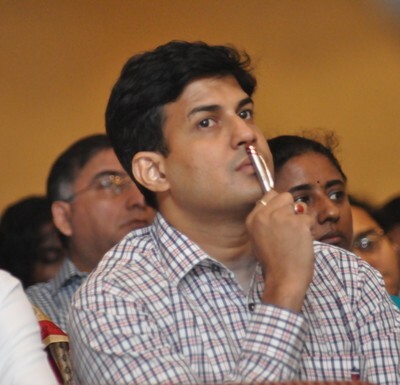 H. R. Venkatesh Rao, Sr. Anchor, CNN-IBN. 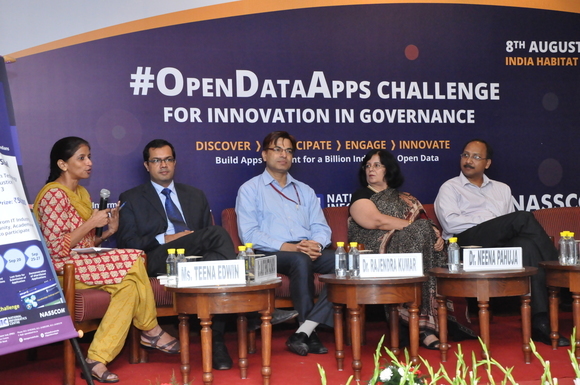 The panel debated on possible innovations with open data, data monetization, economic model and commercial viability of applications and solution built over Open Government Data. Data classification should be according to sensitivity. 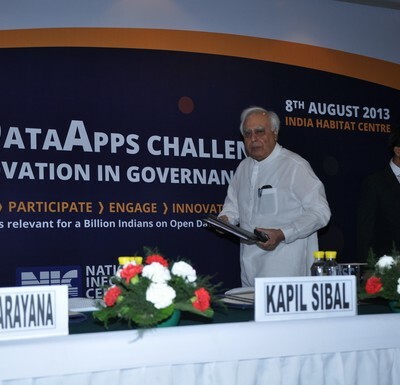 Open Data movement should move up to District, municipality and village level. 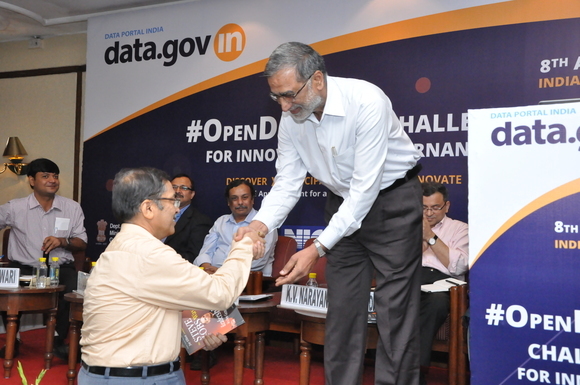 Creation of Data Economy using open data. Better cleaned and quality data is required for innovation. 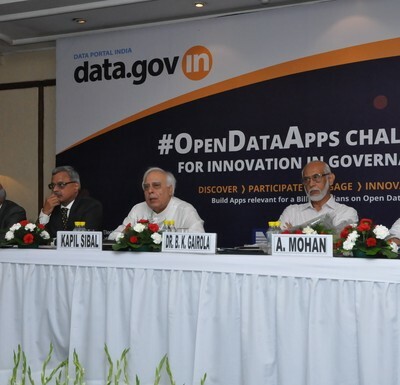 Need of the hour is to ignite the data-driven innovation in order to make Open Government Data initiative more relevant and useful for citizens. 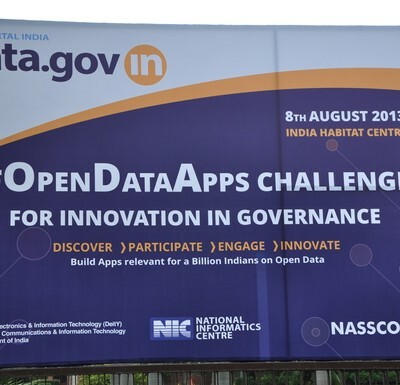 Prior to this conference, NIC & NASSCOM organized four Open Data Meets with Start-ups, Developer Community and academia in Delhi NCR & Bengaluru during the Month of July to “educate the community on types of datasets published, its usability and accessibility”. device to know all these. 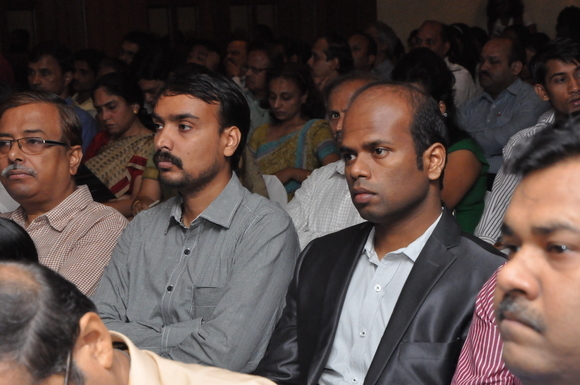 Can technology help by providing information regarding availability of doctors for the end consumers? 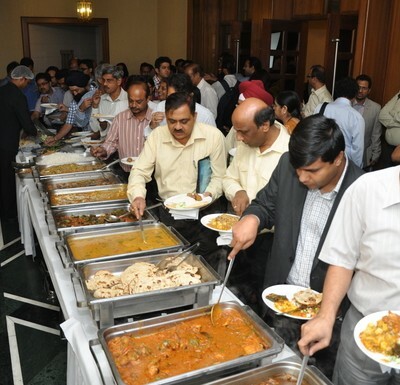 Can technology help by providing information regarding Availability of blood/donors for the end consumers? Can technology help by providing information regarding dosage of medication for the end consumers? Can technology support a remote General Physician to connect to a Super Specialist? 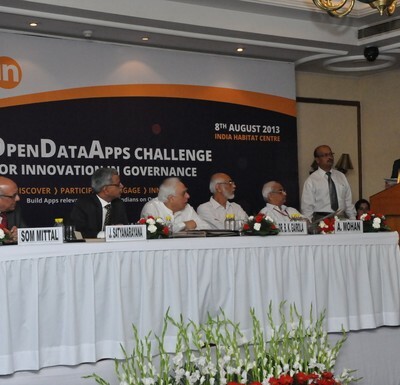 Can gaps overcome using mobile based initiatives like Text SMS, Voice Calls and Call Centre / IVRS? © 2019GOVERNMENT OF INDIA All rights reserved.